First, identify for yourself what the problem is. What would you like to see changed and why? Before communicating with your child, determine why this particular issue really matters. For example, one mom told me that she wanted her child to study without listening to rap music. She felt that the music made it harder for her daughter to get the work done efficiently. As a result, her daughter ended up staying up late and was tired, grumpy, and unfocused in school the next day, which was impacting her grades and, ultimately, her attitude toward school. Having thought through the “why” is important in talking to our kids because it will be the first thing you discuss with them. Let your child know what you are really concerned about, not the underlying cause that you personally suspect and not all of your fabulous solutions, just the problem that you see. Allow your child to confirm that they, too, see these concerns. If we take the example of the mom I described earlier, she might say, “Look, it seems to me that you’re tired a lot, sometimes really grumpy, and not able to get results in school that you’re happy with. Am I way off base, or is any of that true?” If they agree, proceed to Step 3 below. If not, and they’re willing to talk about it, then ask what it would take to convince them that the issues you’re raising are real. You can’t move on to solutions if they don’t agree there’s actually a problem. Once they have acknowledged that they share your concerns, be empathetic before presenting your hypothesis. “It definitely sounds challenging. Look, I have a hypothesis that I want to share, and I want you to hear me out, especially if you find yourself quickly disagreeing. I want two minutes to share it without interruption, a minute of just quiet, and then you are welcome to tell me whatever you think, including how wrong you think I am if you do.” Present your case: for example, that listening to rap music while studying doesn’t work for most people, how it forces the brain to go back and forth between two tasks that both demand the use of language skills. You can’t say it’s absolutely impossible, but the research is definitely there. Give your child a chance to tell you how wrong you are, or how it doesn’t apply to them, or to surprise you by admitting that they know you’re right. Afterward, acknowledge that you can’t be certain that you’re right, and so you won’t insist they change it. Pause before telling them that you do insist that they make an informed decision. When they look at you, rightfully, with suspicion, you explain. “Who knows? The research may not apply to you, so I’m going to give you a choice. Either trust me that it’s true and give up the music while you work, or try an experiment to find out for yourself.” Let them ponder that choice and make a decision. On occasion, students are willing to let go of the battle right here and make a shift in what they’re doing or offer a compromise that you’re comfortable with for the time being. If they ask about the experiment, then explain they need to do 10 minutes of homework while listening to rap music and 10 minutes with classical music or study music each day for a week, alternating which comes first each day. At the end of the week, they can make their own decision based on what they’ve found out. If your child is likely to be honest with you, ask them to share the results with you. Review it together, asking questions instead of making judgments. Questions are best if they focus on what was discovered (“What did you notice?”) and not on how they will change (“So, are you ready to switch what you listen to?”) People go through various stages on the road to visible change, and pushing for an immediate change based on a week of data may well result in backsliding. Be glad that the conversation is out in the open and that you two now have a reference point about what works and doesn’t work. That shared understanding opens the door later to a conversation about what might be in the way of their changing their study habits. Of course, if they’re not willing to discuss the results openly with you, then tell them they don’t have to share the results, nor do they have to make a change even if they know it’s actually a better idea to. By being so explicitly supportive of their choice, they will come around when they’re ready, certainly more quickly than they would have by your making them. With this approach, your child may not adopt your ideas immediately. However, if and when they do, it will be because they have learned why it’s a good idea. In the process, they’ll have learned something: not just what music helps them study best but, more importantly, how to make better decisions for themselves through the power of small experiments. Looking for more parenting tips and strategies to help your child be successful in school and beyond? 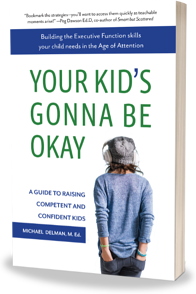 Michael Delman's book Your Kid's Gonna Be Okay: Building the Executive Function Skills Your Child Needs in the Age of Attention is available in print and as an e-book. Download a free excerpt below.